Otama has never had good relationships with men, and ironically enough, she must marry one in order to financially support her family. She is introduced to Suezo, who tells her that he is a widowed merchant. This a lie, though. He is actually an already married moneylender who thinks of Otama as a mistress. Not a particularly noteworthy film, but still, fairly decent. The main appeal here has to be Hadeko Takamine, who is as captivating as ever. The script forces a few too many dramatic coincidences which does sort of downplay her subtle greatness. The dubbed VHS source doesn’t help either. Still, she feels right at home here. A feminist drama (of sorts) where money becomes the downfall of many – sound familiar? That aside, she is quite wonderful, but I don’t think I could recommend this to someone as their first exposure to her. The melodrama is most likely not her fault, but the script’s. Yes, you could say this is sort of a wannabe-Naruse but it does have some unique merits. The most obvious case being the fairly liberal, but well-executed use of tracking shots and wide-angle lenses. This isn’t eye-opening innovation but considering the shape the print is in, it looks quite great. On the other end of the (technical) spectrum, the music is very, very bad. It may very well have been added in by the American distributors. Same goes for the random voice over that occasionally provides unneeded exposition. Despite my seemingly indifferent attitude towards the film, I did enjoy it a great deal. There’s some universal film-making conventions of the 1950s that drag it down, but I’d say it’s miles above it’s melodramatic brethren to the West. As of now, Shiro Toyoda’s films are quite hard to find. Guess we’ll (or I’ll) just have to keep our fingers crossed that someone like MoC will release a few of his films. I definitely would like to see more. Probably closer to Gosho in style than to Naruse. In any event, stylistically much more conventional (i.e. to Hollywood norms as appropriated by the Japanese film industry). Some really good performances here. 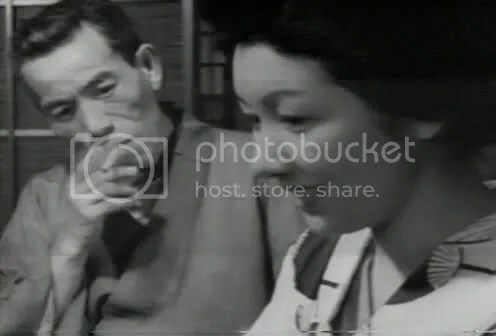 Not just Takamine, but also Eijiro Tono and Kumeko Urabe in much more central roles than normal.. There are a couple of unsubbed Gosho DVDs — and there were lots of unsubbed videos once upon a time. BTW — the dubbed video version of Gan is supposedly cut fairly significantly. My subtitled copy is 106 minutes. The version I watched was 106 minutes. I would like to see a proper DVD of this film. I remember it from many years ago and was quite struck by it. And I love Takamine. Now that i have seen Naruse and Gosho maybe I would be disappointed rewatching it. Glynford — I don’t think you would be disappointed too much. The editing (and scoring) is much more conventionally Hollywoodesque than one is used to from the top tier directors of that era — but the story and the performances are good enough to make up for this. would be my first exposure to this chick but that’s ok. i’ll try to track it down. but I don’t know if I could handle a dubbed version. AHHH! !